As far as I can find, ciclosporin (or cyclosporin) was first used to treat autoimmune hemolytic anemia in Germany in 1986. (Pogglittsch and colleagues, Wien Med Wochenschr. 1986;136:567-70). Some readers have expressed surprise that ciclosporin, which is best known for acting to prevent the rejection of transplants – a T-cell function, should be thought useful for a disease caused by antibodies. However, all IgG antibodies are produced because of an interaction of B-cells with T-cells. T-helper cells are required to make IgG antibodies. My first experience of using ciclosporin in this way came in 1995 when we seemed to be experiencing an epidemic of hemolytic anemia in our CLL patients. I noticed they were all multiply treated patients and all had received fludarabine. It was this that prompted me to write about hemolytic anemia triggered by fludarabine. (Myint et al, Br J Haematol. 1995;91:341-4). I knew, of course, about the early paper by Dameshek demonstrating that radiation or chlorambucil could trigger hemolytic anemia in CLL, but, quite honestly, that seemed to have been a rather rare event in my experience. As it happened, about this time I attended a lecture by Ethan Shevak, who introduced me to the idea of regulatory T cells (later published as Shevach et al. Novartis Foundation Symposium 1998; 215:200-211). This is what he told us: mice thymectomized on the third day of life develop a wide spectrum of organ specific autoimmune diseases depending on the strain. Reconstitution of these mice with CD4+ CD25+ T cells from normal mice prevents the development of disease. These cells can also prevent the transfer of disease by autoantigen-specific cloned T cells derived from neonatally thymectomized mice. Elimination of CD4+ CD25+ T cells, which constitute 5-10% of peripheral CD4+ T cells, leads to spontaneous development of various autoimmune diseases. In other words young animals have the capacity to make antibodies against themselves, but this capacity is kept in place by a population of T cells that are CD4 positive and CD25 positive. These cells are known as regulatory T cells – these days they are further identified by being Fox3P positive. They suppress autoreactive T cells by specifically inhibiting the production of IL-2, an action that seemed to me to be remarkably like that of ciclosporin. Regulatory T cells are very susceptible to killing with chemotherapeutic agents compared to the CD4+ CD25 negative subset, and Fludarabine is particularly toxic to them. 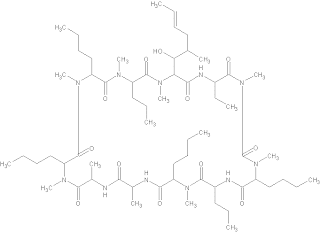 Ciclosporin is thought to bind to the cytosolic protein cyclophilin (immunophilin) of immunocompetent lymphocytes, especially T-lymphocytes. This complex of ciclosporin and cyclophylin inhibits calcineurin, which under normal circumstances is responsible for activating the transcription of interleukin-2. It occurred to me that cyclosporin might mimic the function of regulatory T cells in denying interleukin-2 to T-helper cells. Faced with hemolysis following fludarabine that was uncontrollable by standard treatments, I thought it worth trying ciclosporin on theoretical grounds, as well as being supported by the empirical evidence that it had worked in anecdootal cases in the literature. When we were designing the LRF CLL4 trial I took on the role of giving advice to investigators who were confronted with uncontrolable AIHA following fludarabine. My advice was almost always to try ciclosporin. After his retirement, Danny Catovsky had a sabbatical in Houston and I believe that he passed on our success with ciclosporin to MDACC. Certainly, Mike Keating now recommends ciclosporin for the treatment of AIHA in CLL. In a previous post you stated that AIHA afflicted 10 to 20% of patients with CLL. Is it equally distributed among all groups mutated/unmutated, CD38+/- etc? Is it possible that CLL patients might benefit from vitamin D supplementation not only for their CLL but also to avoid AIHA compilcations? This reference is now 16 years old. If vitamin D did anything for AIHA I think we would have known by now.